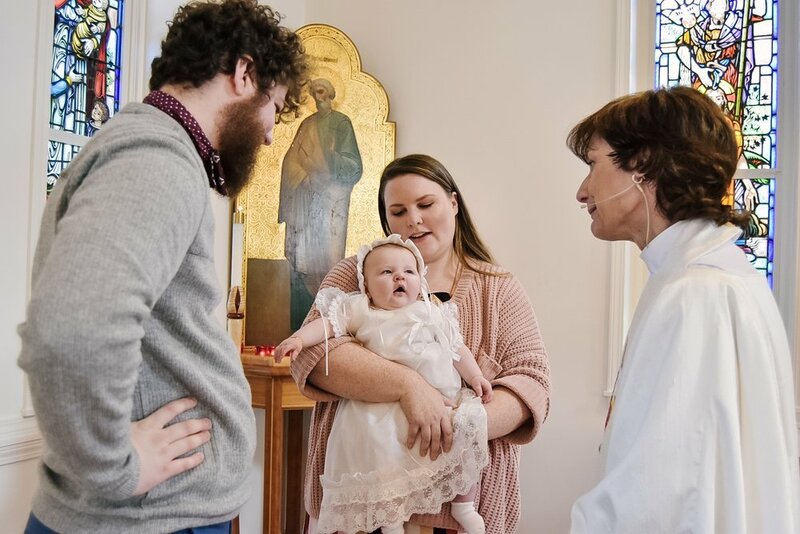 Rooney received the Sacrament of Baptism at St. Bartholomew’s Episcopal Church on Sunday, the 20th of January, wearing the same gown made by my grandma that I wore to my baptism 28 years earlier at the same church. It’s funny how life comes full circle. She was the best baby! She smiled and played with our program through the whole service. I only took her into the hall briefly after communion. She smiled at Mother Nan while the water was poured over her head. A few times we caught her staring at our choir director, captivated by his tenor singing voice. After church we all met up at my mother-in-law’s house for a spaghetti lunch. My mom and I shopped at Costco and Walmart for everything the day before. It was a hit! We were so blessed to have so many of our family members attend the service. I was even more blown away by the thoughtful gifts Rooney received to mark the occasion. We will have to get her a little jewelry stand for her room bow because she’s racking up quite the collection. It was a day we won’t soon forget!